Faces and expressions have fascinated Sarina Khoo for as long as she can remember. Her early works whilst studying at Unitec were developed from nudes and figurative pieces to portraiture, specialising on the female face. There is an element of design in her work and Sarina admits she is influenced by illustration, particularly from the world of fashion. After graduating she travelled and lived in London, working in the fashion industry as a visual merchandiser. She didn’t have time to paint or draw, but was inspired by the creativity she was immersed in. Sarina works from her home studio in Mangawhai Heads, a dedicated space joined to the house with plywood-clad walls. 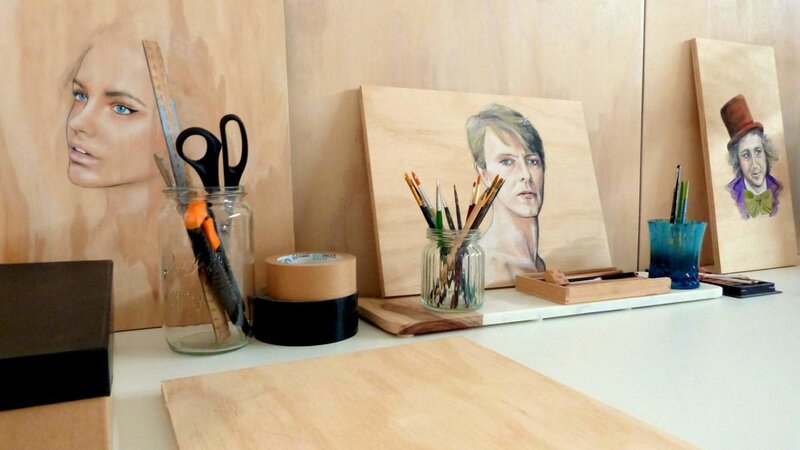 Her signature style is to use wood as the base of her image. Sarina chooses grains in the wood that will work with the face, complementing it with the woods natural rawness and inherent flaws. Pencils, paint brushes, gouache, pastels, cotton buds, makeup, eyeshade and charcoal contrast one another, and along with the woodgrain help tell the story of our own beautiful imperfections.